2. Who We Are Is Enough. We understand that the key to our "learning" is often to "unlearn" the things which we were told about ourselves, whether that relates to our sexual orientation and others' perceived ideas about what that "should be"....or whether that relates to our relationship success, our financial success, or anything else that we have been told about who we are that is not true. We understand that we must be open to unlearning that which no longer empowers us. In that sense, we choose to come to an acceptance that "I know nothing." And in that "knowing nothing," we become available to take in new information and new ideas, reorganizing the hardwiring that has created barriers for us in our lives in terms of how we operate and how we see others. Acceptance of this allows us to understand that anyone and/or any situation that triggers us, is simply a gift in the end result. It is a mirror that helps us see and understanding what in us needs healing. We then have a choice as to what we want to do. That healing allows us to awaken to the gift of who we are. And, part of our "learning" is to Our real learning occurs when we acknowledge, "I know nothing" and invite in new information and ideas. 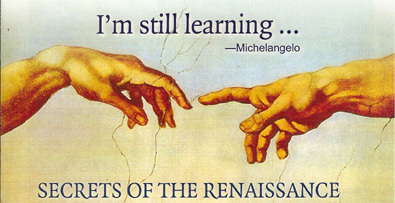 Renaissance means rebirth, and it is the name given to the transition from medieval to modern times in Europe, when the rediscovery of ancient Greek and Roman cultures sparked a creative revolution in the humanities, the sciences, and the arts. We feel that our society and world have the opportunity for a "renaisaance...a rebirth" of who we are, leaving to the curb those ideas and opinions about who we are that do not ring true for us. Here's to the renaissance, the rebirth, for each of you as a Stand UP Speak OUT Wind Changer.